The MFT Release is live! Are you headed to shop? I have one last card to share using the new Pressed Flower set. Its a very subtle look but I stamped the branch image in a light green all over a piece of cardstock. I used the Bold Stripes Cover Up and die cut the stamped paper. I added that to a white card base and then added a white hello on top of that. Definitely a clean and simple card! Check out the MFT blog for more release details! Thanks so much for coming by today! I love clean and simple cards! This is great! Love the look of the subtle green branches, Laurie...so clever and so beautiful! Indeed, clean, simple and beautiful design! Wow! Really cool and elegant! So pretty! 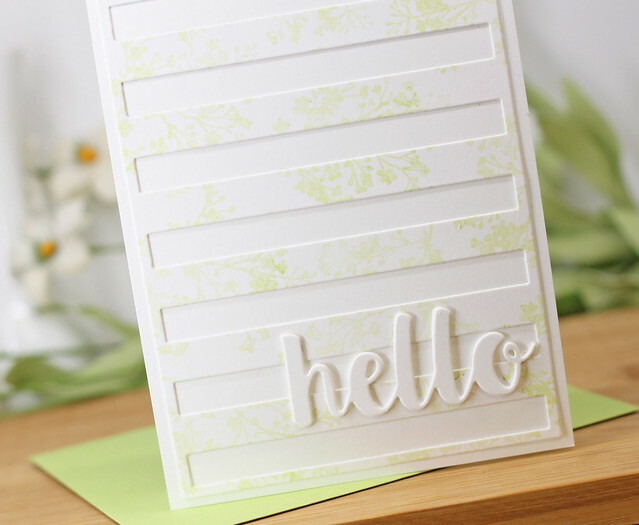 Love the subtle stamping and the Cover-Up die! Your card is simply beautiful! I love the subtle color and stamping! So well thought out! I love your CAS style... beautiful card! I love this simple but beautiful card! Lovely and elegant! Your card illustrates the expression that sometimes less is more. Thanks for sharing your beautiful creativity! So many great products to choose from. A great job with your card. The green is a lovely addition to this card. Such a soft and pretty card! Love it! A very subtle but beautiful card! Lovely CAS design Laurie, TFS! I love this idea. So many ways you can use this flower stamp set. Thanks for the inspiration! The background die with the soft flower stamp. brilliant idea. I am going to have to try that out. Super cool effect! Gorgeous! Love pretty green and white! So pretty! :) I love the light green stamping on the background. Such a preset subtle background. Very pretty with the subtle stamping. Soft and very delicate card. What a lovely clean and simple card. Very pretty and quite classy! So simple and inviting, very nice! Fabulous card! I love the subtle stamping! I like that you mixed old and new items. Beautiful, clean and simple. What a beautiful, subtle card! I don't think I would have trusted myself to try just the light colors, but I love how that looks. It's beautiful and sophisticated, and I think I'm going to have to try and CASE it, because this is not my normal style, but I kind of wish it were! Thanks so much for sharing with us. This is an elegant card. Making your own patterned paper is always fun. Simple yet so elegant. thank you for sharing your creativity. Your card is so pretty. The background is beautiful. Truly awesome! Love the simplicity & soft coloring! I love the soft green and matching envelope. You could make it in every color with different sentiments. What a simple yet effective card. Lovely! Your card is just so beautifully understated and elegant. Sometimes less is much more - I love it. TFS.